Erie County, previously split into Congressional Districts 3 and 5 and overseen by representatives Mike Kelly and Glenn Thompson, will now be known as PA District 16 under Kellyu2019s supervision. For the uninitiated, Pennsylvania is a political mess. There are many problems — structural, financial, and partisan — that contribute to the Commonwealth's collective political loathing and serial gridlock. But chief among the elements of its despair was a gerrymandered electoral map that included two partisan congressional districts infamously described as having the shape of Goofy kicking Donald Duck with the connecting tissue of Goofy's toe and the duck's tail wide enough to be comprised of a single restaurant in King of Prussia, just north of Philadelphia. 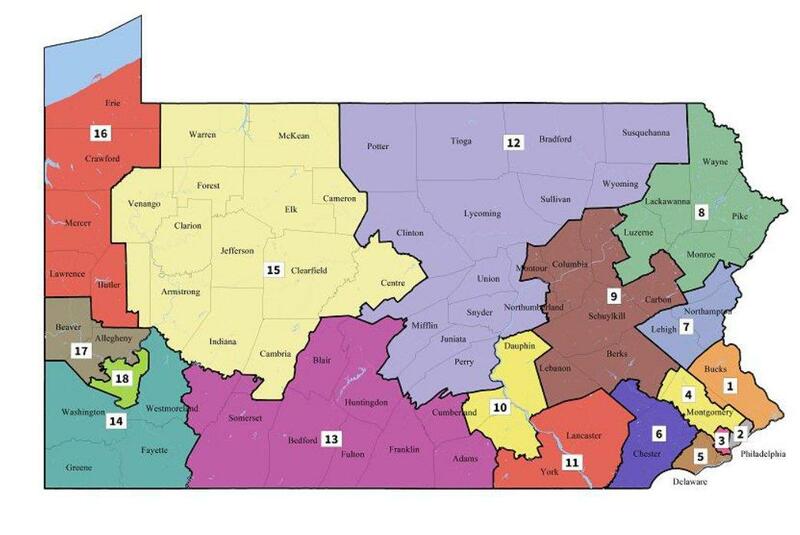 The League of Women Voters sued the Commonwealth of Pennsylvania in Commonwealth Court on behalf of 18 Democratic voters last June, arguing that the 2011 Pennsylvania congressional map represented a partisan gerrymander that discriminated against Democrats based on their political viewpoints. Different from racial gerrymandering, in which voting districts are drawn to disenfranchise voters of a particular race or ethnicity, partisan gerrymandering occurs when the party that controls the legislature draws a map "to entrench that party in power and prevent voters affiliated with the minority party from electing candidates of their choice," as defined in the petition filed by the League of Women Voters last year. Some studies have called Pennsylvania the most gerrymandered state in the country. In some parts of the state this meant that a single county might have as many as four congressional representatives in order to carve out Republican strongholds. Pennsylvania's congressional delegation is currently comprised of 13 Republicans and five Democrats even though Democrats have a 25 percent advantage based on total registered voters and most national elections are near even splits. The Pennsylvania Supreme Court agreed with the League of Women Voters that the 2011 Congressional map gave Pennsylvania Republicans a distinct and partisan advantage. In an opinion delivered January 22 the court gave the General Assembly and Governor Wolf until February 15 to redraw the Commonwealth's congressional districts. The court ordered that the new map should follow county borders to the extent possible and it should not "divide any county, city, incorporated town, borough, township, or ward, except where necessary to ensure equality of population." The intent of that clause was to rejoin counties, like Erie County, which had been divided in the creation of the 2011 electoral map. Democrats were effectively neutralized by separating counties like Erie, which historically had been Republican-leaning in Congressional elections, and by distributing the Democratic base across multiple congressional districts. The Cook Partisan Voting Index (PVI) measures the extent to which voters lean toward one party and signifies the likelihood of a candidate from a particular party having electoral success. Republican Congressmen Glenn Thompson (PA-5), who consulted with Republicans in the General Assembly on the 2011 redistricting, and Mike Kelly (PA-3) enjoyed greater than 10 percent advantages over Democratic challengers. In PA-5, which includes the eastern half of Erie County, there was less than a three percent chance of a Democratic victory using the 2011 map. In PA-3, which includes the city of Erie and western Erie County, chances for Democratic success slipped to just 1.85 percent. The state Supreme Court rejected maps put forth by the Republican-led General Assembly, Pennsylvania Democrats, and the Governor's office in favor of its map which splits fewer municipalities and makes more compact congressional districts than the challenged map or any of the remedial maps submitted by the aforementioned political units. The map established by the Court essentially puts the electoral map for congressional races in concert with the near split vote that is common in Pennsylvania during national election cycles. Moreover, the new map makes Erie County whole again — much to the delight of Erie County Democrats and Republicans who viewed the 2011 map as a challenge to the interests of the northern tier by way of consolidating power in Butler County and central Pennsylvania. Prior to Mike Kelly's win in the 2010 midterm election, Erie County had not been represented in Congress by an Erie resident since former Governor Tom Ridge first represented what was then the 21st Congressional District in 1983. In addition to all of Erie County, the newly drawn 16th Congressional District includes all of Crawford, Mercer, and Lawrence counties, as well as the western half of Butler County. While PA-16 is likely to remain Republican in 2018, Democrats are given better odds than they have had in many years. The new map gives Democratic challengers just over an 8 percent chance of victory. That's good news for Chris Rieger, the young lawyer from Cranberry who intends to take on Mike Kelly in November's general election. Rieger has endeared himself to Erie Democrats and could have a future in electoral politics despite his uphill battle for fundraising dollars and the Republican "lean" in western Pennsylvania. Several Erie County Democrats are reportedly considering running for Pennsylvania's 16th Congressional District. State Representative Ryan Bizzarro and attorney Ron DiNicola top the list of suspected local candidates. Both can raise funds and DiNicola captured 49 percent of the vote against former Congressman Phil English in 1996, but neither has made public moves toward the May primary. Nevertheless, this probably isn't the year for Erie County Democrats — or Democrats in general — to take this seat. While many are hoping for a change in Congress akin to the success Republicans had in 2010, that level of success seems unlikely given the fact that national political candidates continue to seek President Trump's company and support despite waning popularity in the polls and mounting evidence of misconduct by members of the President's campaign team in 2016. Moreover, Rep. Kelly, who was an early supporter of the President, has suffered little for his transgressions and that's not likely to change anytime soon. In short, PA-16 probably stays red despite the efforts and enthusiasm of and for Chris Rieger and company. That said, congressional candidates rooted in Erie County have an opportunity to set themselves up for the long-game. Both Democrats and Republicans in Erie County should be courting a candidate with the charisma and the cash to touch Butler on their way to Washington. Because even though 2018 may not prove to be the sea-change race everyone wants, 2020 might not disappoint. That's momentum Erie county can use the next time congressional districts are redrawn...in 2021.